We decided to send the Save the Date cards out about 5 months prior to the wedding. It actually is a postcard with a photograph from our engagement shoot that we did with Joseph Laurin. Everyone has told me that they loved the photo we selected and the postcard, which made me happy! 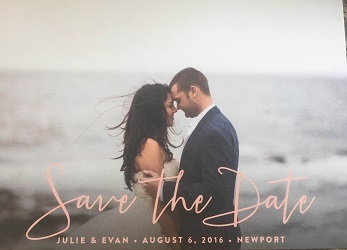 Evan and I followed the suggested templates on the website, which included suggestions to add information to make it easy for your guests such as hotel locations, room block accommodations, gift registry information and the addresses of where and when to be for the wedding. 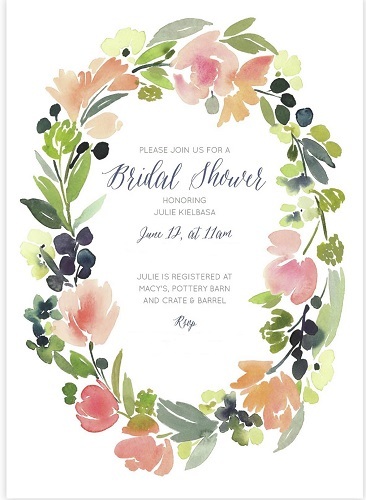 I also suggest adding the bridal party information. 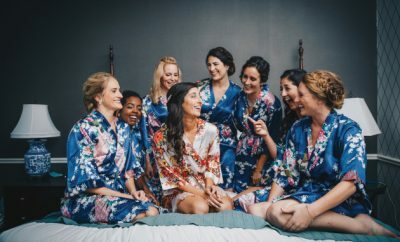 It is always interesting as a guest to see the bridal party and the story behind how each member is important to you. 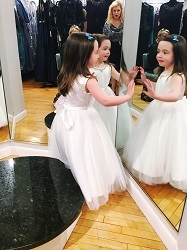 Our flower girl is Evan’s niece, Hayley. (Ashley Long, Evan’s sister and also a bridesmaid, is Hayley’s mom.) Hayley is almost 4 years old and was born right around the time Evan and I started dating. She is such a sweet little girl, with the biggest heart and is so important to Evan and me. 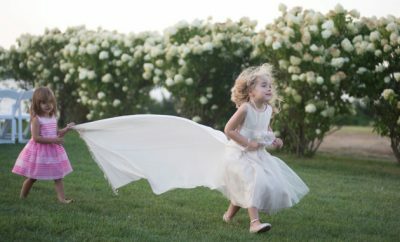 There was no question about whom we wanted as our flower girl! Ashley, Hayley and I went dress shopping together. We went to Alexandra’s. Hayley tried on about seven dresses until we found the perfect one. It did not need altering or adjusting and was new on the floor; it was like it was made for her! I was happy that we got to share that special day together, it is a memory we will always have! I prefer to go to the store and actually see the dresses, feel the fabric and see it on as opposed to online shopping. I wanted something Hayley would feel comfortable in but was also dressy! I wanted her to stand out, so I chose to put her in white, like me! All of the bridesmaids and groomsmen will be in navy, so I think that the white will look perfect and make her feel like a special part of the day. With that idea in mind, when we went shopping, we just grabbed the dresses that we liked and started trying them on. 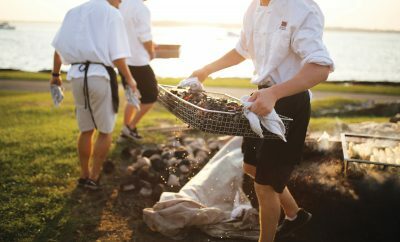 We did not discriminate; sometimes it’s the one that you do not like as much on the hanger looks the best! On the big day I will incorporate some small roses in her hair or maybe a flower crown, perfect for a 4 year old! Up next on the wedding docket is getting our wedding bands and finalizing the cake choice. We also have the tux fittings for the groomsmen, my hair and makeup trial and solidifying the wedding day transportation plan. It is all coming together and getting very exciting!